Never thought that travelling to China would be so wonderful, I guess I should have look up more to the local tourist sport before spending lots of money just to travel to European countries and we can take a better understanding about different the ethnics in China. Lijiang, in Yunnan, is a really wonderful place to visit. There are so many places you can visit here, like the Jade Dragon Snow Mountain, Tiger Leaping Gorge, Black Dragon Pool, Yufeng temple, Lugu Lake and Old Town of Lijiang that is one of the UNESCO heritage site. 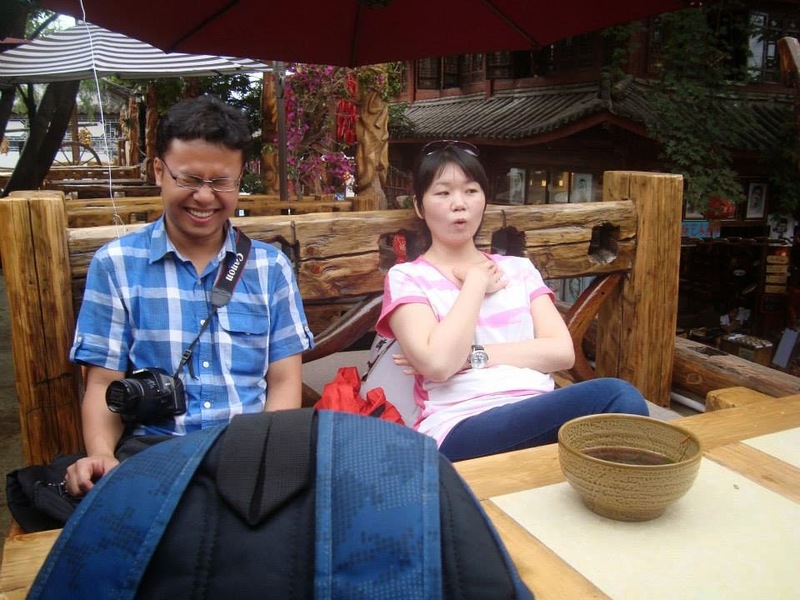 We were planning for only 4 days and 4 nights for the trip, although the weather condition on our last day made us take another night in Lijiang. So on the first day we went visit a local school uphill far from the city. We played and interacted with the local primary students there. They speak mandarin and absolutely no Basic English, so it was difficult for me to communicate with them in English. Then we went to the Black Dragon Pool to visit the local museum and stroll a bit until quite late. Then the next day we walked 5.2 km for the Tiger Leaping Gorge. It was quite I walk but I don’t feel tired at al as the views in the area was so refreshing and we had plenty of joyful talk during the walk. After lunch time we wen to my favorite place in Lijiang which is the Lugu Lake! We had to pay extra for the place but we didn’t regret it at all. The view was just so wonderful! The local people let their horses just freely relax and grazed around the lake. They also provide little canoes for the tourist for crossing the lake. It was just so great I could not actually describe how amazing the Lugu Lake was! On our third day we went for hiking at the Jade Dragon Snow Mountain and went for the shopping at the Old Town of Lijiang after dinner. And exactly on that night I found my favorite store to most likely spend my money on! Toys and K-pop store! Although the Town is very traditional they also have the sense of modernization on what I am not expected so far. Because Lijiang, I believe they don’t really take westernization that much but seems like near that are they rely most on the industrialization and tourism. For the last day we spent by waking up very early to see the Sunrise at the highest place on the Old Town of Lijiang. This experience was so memorable for everyone and I could say our teacher because we actually did not expect that each of us would wake up on time just to watch the sun rises. This trip is my last trip with IKTMC as I am finally going to my last year at secondary school. I was hoping that my last trip would be very memorable and wonderful. Well I guess my hope came true. Many thanks to my wonderful teachers, Ms. CC and Mr. AF in making my hope came true. This trip is totally “ An Experience To Remember”. Can't contain my laughter seeing Mr. Andy's expression here! hahhaha !! !